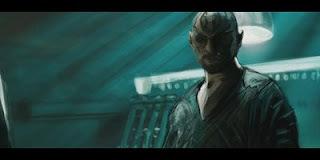 Painting people is one of the things I really need to work on so I got a screen cap of the Star Trek trailer and started painting the villain, Nero. I chose him because he's more interesting looking than the other characters and the lighting in this scene is awesome. It's not out here until this weekend... but I 'acquired' a copy to watch because everything was being spoiled online anyway. Awesome movie! This is what the new Star Wars movies should have been like, let alone Star Trek!